Grant monies and donations to the library will fund the upgrade of the children’s area of the library. These upgrades will allow us to offer a few additional efficiencies including a more open children’s space that will enhance our library so we can provide better services for our entire community. The grant monies come from various funding requests, including: NYS Grant Funding from NYS Public Library Construction Grant and NYS Bullet Aid for Public Libraries (Senator Funke); May K. Houck Foundation; Estate of Robert J. Bride; Hallowell Foundation; Kade Project; and the Friends of the Mendon Public Library. The Mendon Public Library provides services to approximately 1,700 children each year and the library focuses on providing many opportunities for early literacy. Using current research and community input, the library proposed changes to the existing children’s space that would give children and their caregivers the best possible place to gather, discuss, learn, and enjoy. According to experts, the best way to engage early learners is through literacy-rich and play-based pavilions that allow children to explore and navigate the world of reading. Libraries are no longer quiet “shushing” places, but, vibrant, hands-on, exploration spaces that provide a range of early learning opportunities. As such, the current children’s area will undergo a transformation in the coming weeks to better design the space to offer a cohesive, bright, safe, and engaging area for our young library users. 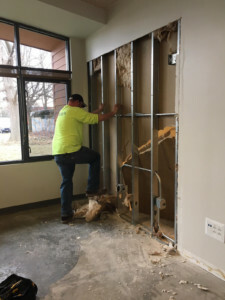 We anticipate that the Mendon Public Library will be open during the renovation and most of the collection will be available for circulation thanks to the teamwork and planning of the Mendon Public Library Board of Trustees, Town of Mendon officials, library staff, and construction crews. Work should all be completed prior to the start of the Summer Reading Program. For more information, please contact the library at 585-624-6067 or www.mendonlibary.org.